[S11] Alison Weir, Britain's Royal Families: The Complete Genealogy (London, U.K.: The Bodley Head, 1999), page 36. Hereinafter cited as Britain's Royal Families. [S58] E. B. Fryde, D. E. Greenway, S. Porter and I. Roy, editors, Handbook of British Chronology, 3rd edition (London, U.K.: Royal Historical Society, 1986), page 29. Hereinafter cited as Handbook of British Chronology. [S11] Alison Weir, Britain's Royal Families: The Complete Genealogy (London, U.K.: The Bodley Head, 1999), page 37. Hereinafter cited as Britain's Royal Families. [S38] John Morby, Dynasties of the World: a chronological and genealogical handbook (Oxford, Oxfordshire, U.K.: Oxford University Press, 1989), page 167. Hereinafter cited as Dynasties of the World. [S58] E. B. Fryde, D. E. Greenway, S. Porter and I. Roy, editors, Handbook of British Chronology, 3rd edition (London, U.K.: Royal Historical Society, 1986), page 27. Hereinafter cited as Handbook of British Chronology. [S11] Alison Weir, Britain's Royal Families: The Complete Genealogy (London, U.K.: The Bodley Head, 1999), page 22. Hereinafter cited as Britain's Royal Families. [S52] G. S. P. Freeman-Grenville, The Queen's Lineage: from A.D. 495 to the Silver Jubilee of Her Majesty Queen Elizabeth II (London , U.K.: Rex Collings, 1977), page 4. Hereinafter cited as The Queen's Lineage. [S52] G. S. P. Freeman-Grenville, The Queen's Lineage, page 6. [S11] Alison Weir, Britain's Royal Families, page 23. [S52] G. S. P. Freeman-Grenville, The Queen's Lineage: from A.D. 495 to the Silver Jubilee of Her Majesty Queen Elizabeth II (London , U.K.: Rex Collings, 1977), page 6. Hereinafter cited as The Queen's Lineage. [S11] Alison Weir, Britain's Royal Families, page 29. [S58] E. B. Fryde, D. E. Greenway, S. Porter and I. Roy, editors, Handbook of British Chronology, 3rd edition (London, U.K.: Royal Historical Society, 1986), page 28. Hereinafter cited as Handbook of British Chronology. [S1] S&N Genealogy Supplies, S&N Peerage CD., CD-ROM (Chilmark, Salisbury, U.K.: S&N Genealogy Supplies, no date (c. 1999)). Hereinafter cited as S&N Peerage CD. [S11] Alison Weir, Britain's Royal Families: The Complete Genealogy (London, U.K.: The Bodley Head, 1999), page 27. Hereinafter cited as Britain's Royal Families. [S11] Alison Weir, Britain's Royal Families, page 26. Agatha of Kiev married Edward 'Atheling' (? ), son of Edmund II 'Ironside', King of England and Ealdgyth (? ), in 1035 at HungaryG.2 She died circa 1093 at Newcastle-upon-Tyne, Northumberland, England. [S11] Alison Weir, Britain's Royal Families, page 27. Canute II Sveynsson, King of England and Denmark also went by the nick-name of Canute 'the Great'.5 He was also known as Knud.6 He was also known as Cnut.3 Canute II Sveynsson, King of England and Denmark also went by the nick-name of Canute 'the Dane'. He fought in the Battle of Assandun on 18 October 1016, where he defeated King Edmund II.3 He gained the title of King Canute of England on 30 November 1016.2 He was crowned King of England on 6 January 1017 at Old St. Paul's Cathedral, London, EnglandG.2 He gained the title of King Canute II of Denmark in 1019. 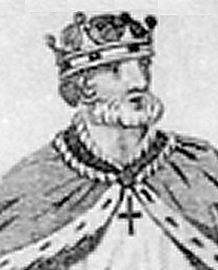 He gained the title of King Canute of Norway in 1028. [S38] John Morby, Dynasties of the World: a chronological and genealogical handbook (Oxford, Oxfordshire, U.K.: Oxford University Press, 1989), page 149. Hereinafter cited as Dynasties of the World. [S11] Alison Weir, Britain's Royal Families: The Complete Genealogy (London, U.K.: The Bodley Head, 1999), page 29. Hereinafter cited as Britain's Royal Families. [S11] Alison Weir, Britain's Royal Families, page 30. [S38] John Morby, Dynasties of the World, page 69. [S38] John Morby, Dynasties of the World, page 147.